Marker Text: The Temple, originally founded as the Hebrew Benevolent Congregation in 1867, was Atlanta’s first official Jewish institution. It grew out of the Hebrew Benevolent Society, organized in 1860 to help Atlanta’s Jewish poor. In 1875, the Congregation built its first permanent worship hall in downtown Atlanta. The Temple of 1931, the third home for its congregation, was designed by renowned Atlanta architect Philip Shutze. Rabbi Jacob Rothschild, an outspoken supporter of social justice during the Civil Rights era, served the congregation for 27 years (1946-1973). On October 12, 1958, white supremacists bombed the northern side of the Temple in response to the Rabbi’s support of the Civil Rights movement. 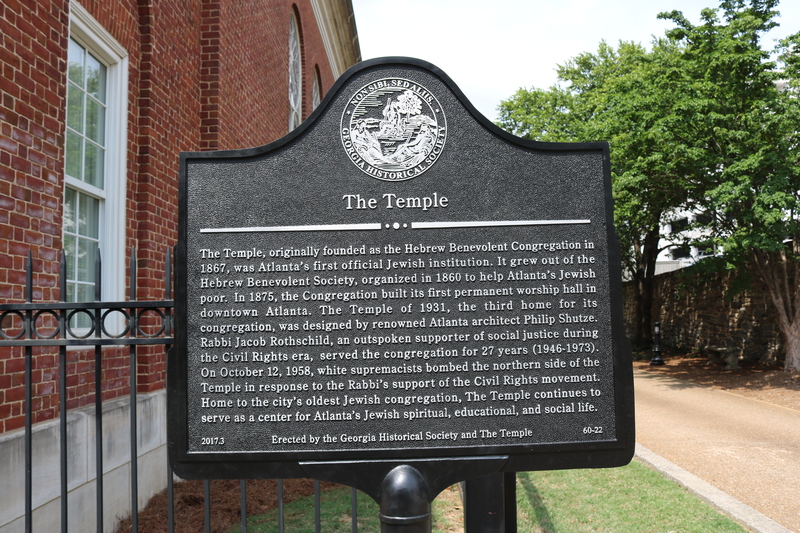 Home to the city’s oldest Jewish congregation, The Temple continues to serve as a center for Atlanta’s Jewish spiritual, educational, and social life.